little did farmers in Maharashtra know, or ever expect, that the thousands of rupees they invested in their soybean crop would be lost to countless colonies of caterpillars. The losses have shaken the region's agricultural economy to the roots. Now, while discussing whether the pest attack was preventable, several allegations and counter allegations are being made and the blame shifts focus from bureaucracy to "careless farmers". Overuse of pesticides, climate change and irreparable damage to the local environment combined to bring down with a crash one of the best crop seasons that the farmers of suicide-ridden Vidarbha had seen in a decade. The spurt in soybean prices in the last crop season from Rs 1,200 to Rs 3,000 per quintal caused the cultivation area of soybean to soar this year to over 1.9 million hectares (ha) in the region--a rise of more than 20 per cent over last year's figures.The crop promised to be a bumper one, until in the early part of August, when the caterpillars rapidly spread to over seven districts. "I have never seen a calamity of such proportion in my 70 years. It was a nightmare. Not a single bean is left on the stalks. We are bankrupt. The food stock we have will last us another month or two. Starvation stares us in the face," says Maroti Doye of Chandrapur district, one of the worst hit districts in the state. Doye's son recently committed suicide after the tobacco-leaf eating caterpillar Spodoptera litura destroyed his crop spread across about 9 ha. Chandrapur has sustained crop losses to the tune of Rs 600 crore. Crops on 235,000 ha, including cotton and tur among others, were also damaged and an estimated 200,000 families affected. The pest attack, which also killed cattle and goats and caused illnesses among people, is in abeyance as the caterpillars have now formed cocoons under the soil, but the farming community still lives in fear of another outbreak during the rabi crop season which begins in late September. The mood in most villages is despondent as there is no hope of compensation. But Subash Sharma of Dorli village is a happy man (see box Spark in the dark). The caterpillar has also attacked bt-2 cotton plants in parts of Warora, Bhadravati and Chandrapur tehsil proving hollow Mahyco and Monsanto's claims that its newly launched Bollgard 2 cotton seed was immune to all kinds of pest attack. Farmers said heavy spraying with commonly used pesticides, endosulfan and quinol phos, and expensive brands costing more than Rs 3,500 per litre could not save their soybean. B M Mankar, agriculture development officer of Chandrapur district, says that the absence of preventive spraying practices in case of soybean has caused the pesticide failure. "Farmers here do not routinely spray pesticides on soybean crops as they do with cotton. The larvae started appearing in late July, but went unnoticed due to rain. It was only around the second week of August that the pests were noticed and the spraying started. By that time the caterpillars were already full grown," he says. The other reason, cited by both the agriculture department and Panjabrao Krushi Vidyapeeth (pkv), Akola, an agricultural university, is spraying is done on the top of the plants, while the caterpillars mostly stay under the leaves. "Thorough spraying from under, needed to wipe out the pests completely, was not done," says Shivaji Sarode of pkv. Farmers don't agree. Arun Pimpalshende, a young farmer from Marda village in Chandrapur tehsil, says in a fit of desperation he grabbed a few caterpillars and dumped them into a can of endosulfan. "But they did not die, you know. The only farmer whose fields were spared of attack Pests spared Subhash Sharma's 26 hectares in Dorli village in the Yavatmal district. Nearly ruined because of chemical farming 20 years ago, Sharma has spent the past two decades developing his land into a holistic biosphere where soil enrichment, water conservation and natural pest control happen within one single integrated process. Sharma has planted thousands of trees on his land, which provide shelter and food to birds, one of the most important natural pest control agent. A toxic-free and vegetation rich environment also encourages the growth of friendly pests like ladybird beetles, spiders, ants and woodlice, which, apart from performing other functions, also destroy eggs and larvae of crop pests. Sharma says his farm was spared because he grows traditional food crops and vegetables and not soybean or cotton--the two major cash crops in the area. "Cash crops planted on a mass scale have spelled doom for farmers. The need of the hour is variety in crops and a toxic-free and safe environment for friendly fauna that naturally destroy pests." Two of them even crawled right out. I could not believe my eyes." The sarpanch of the village adds, "We sprayed directly onto the caterpillars, but nothing happened. Usually, direct spray kills a pest within seconds, but these appeared to be totally immune." According to Gajanan Tajne, a local journalist, "In the past three years, use of weed-killers has gone up steeply in the entire district, especially in the Warora, Bhadravati and Chimur tehsils, which are the worst affected." Weed-killers are sprayed directly into the soil, in which the cocoons of various pests live, before sowing. This helps create pesticide resistance. He also says that the use of weed-killers has reduced ploughing, hoeing and weeding, activities which loosened the soil and exposed the cocoons to birds and the sun. Farmers admitted to the problem, but said spraying was cheaper than labour costs of weeding and hoeing. Everyone agrees changes in climate is the most important factor contributing to this attack. The rainfall pattern in Vidarbha has been disturbed since the past 15-20 years. While traditional belief has it that the rains set in with the advent of the mruga nakshatra, roughly around June 7, in the past decade rains have held off, sometimes till July end or later. This year, the severe drought situation appeared to improve late in July, and from July 26 to August 12, there was satisfactory rain, raising hopes of a bumper soy harvest. But after August 12, the rains stopped and the weather remained cloudy and humid, ideal conditions for pests to flourish. "Once the first rains come in mruga, it is understood that it will rain at least once a week thereafter. But this year we have seen the longest spell with no rain ever. Such a thing has never happened before. Spells of heavy rain are a natural pest controller, as the larvae get washed out," says Shrihari Ganapati Adbale of Marda. While there is no definite climate change data available in the district, observers say rampant industrialization in the region has contributed significantly to the destruction of forests and rise in greenhouse gas emissions. Changes in rural lifestyles, especially the steep rise in the number of motor vehicles and diesel irrigation pumps--the latter pushed by the state government under farmer packages--has also been a contributory factor. Apart from climate change, other environmental factors and changes in agricultural practices are also responsible, say experts. Chandrapur-based environmentalist and geologist Suresh Chopne says one of the very important traditional agricultural practices of maintaining substantial reserves of grass around every field has been completely abandoned as lands have been cleared for crops. "This grass reserve was meant for cattle and also pests, who prefer wild grasses for laying their eggs. With no grass, pests attack crops." He said that the use of weed-killers has also destroyed grasses and other beneficial flora in farms. I have been cultivating soybean for the past seven to eight years. I have seen pest attacks on soybean just once or twice, and that too, extremely mild ones. No one ever dreamed that soy could be the target of such a massive attack. Birds, the other natural pest control agent, too have disappeared given felling of commercially unimportant trees on agricultural lands. Also, single-crop farming on large tracts of land, say experts, is conducive to pest attacks. 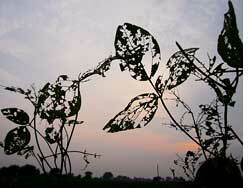 Agriculture department officials have warned villagers not to plant soybean for at least the next three years. The warning has not gone down well with farmers. An angry Adbale says, "Forty years ago when we were growing traditional crops, these agriculture people encouraged us to grow cotton, saying it would bring us cash. When cotton failed, they came saying grow soybean. Now they are telling us to return to jowar and moong, and krishi kendras have no seeds of these crops. They encouraged us to use chemicals. Our lands have become such that there is no yield unless we add more and more chemicals. Goodness knows what new disaster they will bring next."